I was injured playing football in high school and was told I needed to have knee surgery and would miss the rest of the season. Then I went and saw Dr. Swickard, he treated my knee, and I played not only the rest of that high school season, but all through college without so much as a knee brace. I was completely hooked on Chiropractic. After my experience with my knee and being a patient of Dr. Swickard’s all through my college football days, I was pretty sure I wanted to be a Chiropractor. I just loved (and still do!) the way Dr. Swickard and Chiropractic helped people in all walks of life be healthier in a natural way. I did an internship with Dr. Swickard during my undergraduate education, and getting up close exposure to the life of a Chiropractor sealed the deal for me. I received my undergraduate degree from Baker University in Baldwin City, Kansas. I loved my time at Baker; I played four years of football, coached one season, got a great liberal arts education, and met my wife! After graduating from Baker I attended Cleveland Chiropractic College in Kansas City. I am very lucky that such a great school is located here in my hometown, thanks to Cleveland I didn’t have to move away from my family to pursue my passion and career. I had many great instructors, and clinicians while at Cleveland. My favorite time in school was definitely when we got to have our own patients in the student clinic. The hands on experience and guidance from our clinicians was invaluable in my development. 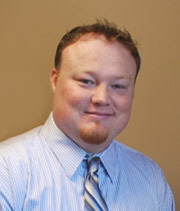 After graduation from Cleveland Chiropractic in 2009 I came to Swickard Chiropractic as an associate doctor. My philosophy and goal for my practice is simple, I want to help more people everyday. The health and wellness of my patients is my number one priority at all times. I try to always keep an open line of communication between myself and my patients so that they can know what I think is best for them during their treatment, and so that I know what their goals are for treatment. I am married to my best friend Megan, who I met when I was a sophomore and she was a freshman at Baker. We dated all through college and were married in 2005. We welcomed our first child, Dailey Claire to the world on June 10th, 2012. She is truly an awesome blessing and we love her so much. She is also already a regular Chiropractic patient of mine! She joins us and her “siblings” Clubber (boxer) and Layla (lab) in our family! Megan and I have great relationships with our families and have a great group of friends from high school and college that we love spending time with. In my free time I love lifting weights, playing sports, and cheering on the Chiefs, Royals, KU and Notre Dame. Our bodies are truly amazing. We all have an inborn intelligence that knows what we need to keep us healthy, and thriving, our bodies just need us to minimize the interference or stress they experience. There are many ways to minimize and overcome that interference or stress we all experience in everyday life, I try to do that personally, and help my patients to do the same thing. For myself and my patients a big part of that is getting regular adjustments. Everyone is different and treatment plans vary from person to person, but for me personally to feel my best I get adjusted once a week. Getting adjusted removes interference from my nervous system, which allows every other system in my body to function better and helps my body cope with the stress of everyday life and thrive, not just survive. I also try to focus on other aspects of wellness such as eating a healthy diet focusing on whole natural foods, taking whole food supplements to fill in the nutritional holes found in every diet, getting regular exercise, regular sleep, and avoiding chemicals and other unnatural substances when possible. In our modern society it is impossible to avoid all stress, but with the right approach we can definitely minimize and overcome this stress. Enough about me! Call our Overland Park office and let us know how we can help you! I would love the opportunity to help you take your first step to better health!